When Diana of Suburban Girl Studio mentioned that she was going to host a blog hop where partners exchange mismatched earrings made with art beads I just couldn't resist. As my hair has gotten longer I have fallen back in love with earrings but just not any earrings. No only artisan ones made with art beads. I was matched up with Iveth Caruso of Creative Atelier and she sent me the most gorgeous earrings. Yes earrings! The requirement was for only one pair and she sent me two. I just love both pairs as they are long enough and bold enough to see even with my hair down. I have worn the blue & copper ones often and am always complimented on them. The black pair actually went to a friend who is wearing bold earrings since she lost her hair due to chemo. Now that you have seen my exquisite pretties be sure to check out what everyone else received. 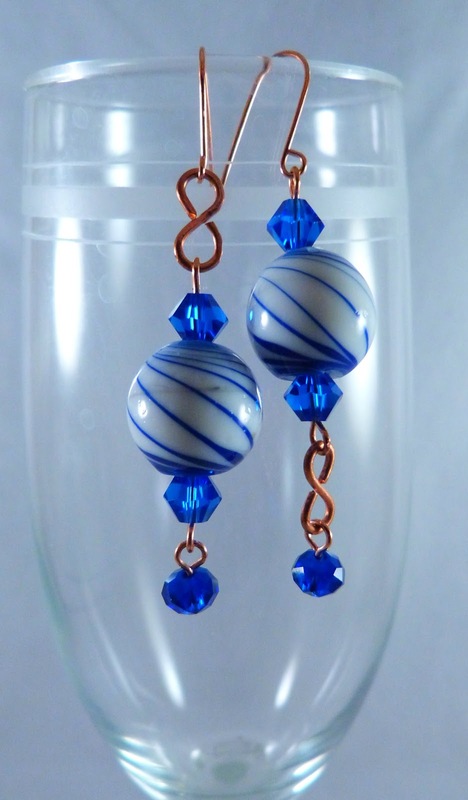 Both earrings are so crisp, both in color and design. And how delightful that you were able to share a pair to support a friend! Oooooo bonus! Lucky lucky getting two pairs! Thank you for participating! They are pretty! I love the ones you sent her too! Such pretty pretties! I hope your friend is drawing comfort from hers. You are a good friend! Very pretty! and so awesome that you could treat your friend to some artisan goodness! Shai! Two pairs of earrings?! Well thats just lovely huh? Of the two pairs that Iveth sent to you I like the zebra glass with black spiral wire one the best. Cool! So sweet that you shared with your friend. And I love those brown/red lampwork beads you used in the earrings you sent to her! LOVE LOVE...and love!! Ooh, they are very nice earrings! And so lovely that you got 2 pairs so you could share!